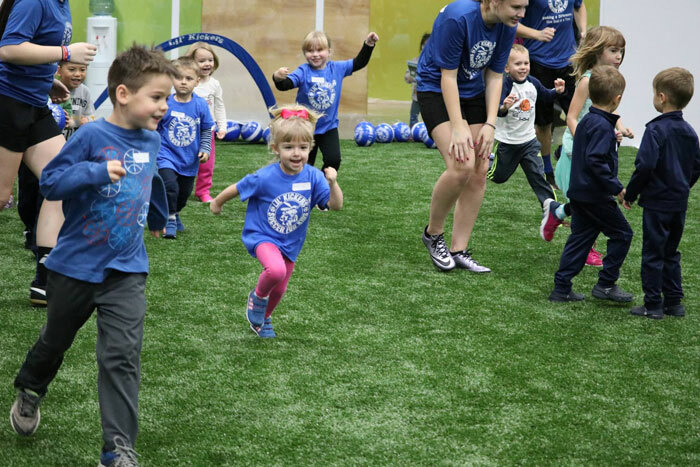 Mill Creek Arena Sports Lil' Kickers enjoy open house. Photo courtesy of Arena Sports Facebook page. Mill Creek’s new 98,000-square-foot Arena Sports indoor sports complex began their “rolling opening” on Saturday, October 21, 2017, with an open house and Lil’ Kickers soccer classes. Arena Sports spokesperson Susan Callahan wrote in an email that Lil’ Kickers classes started on October 21st and that adult and youth soccer leagues will begin soon as well. Arena Sports founder and owner Don Crowe and his family were on hand at the October 21st open house, welcoming visitors and registering new Lil’ Kickers soccer students. Crowe explained features of the indoor Family Entertainment Center such as the classic bowling, mini bowling, two-story laser tag, rock climbing wall, arcade, and restaurant will open as their construction completes. According to the Arena Sports website, the Lil’ Kickers soccer program has grown into an international franchise with over 130 locations in 32 states and Canada since its start in 1999. Crowe said his wife designed the Lil’ Kickers soccer program with the goal of introducing kids to the sport without burning them out. He said the program develops the child’s social and emotional skills as well as providing healthy exercise by focusing on having fun. Lil’ Kickers Classes: Registration now open. Classes began October 21st. Adult Soccer Leagues: Registration for now open. Drop in games every Friday evening. Youth Soccer Leagues: Registration now through November 11th. Six-game season starts November 4th. Click here for more information: Arena Sports. Mill Creek Arena Sports full size indoor soccer field. Photo credit: Richard Van Winkle.